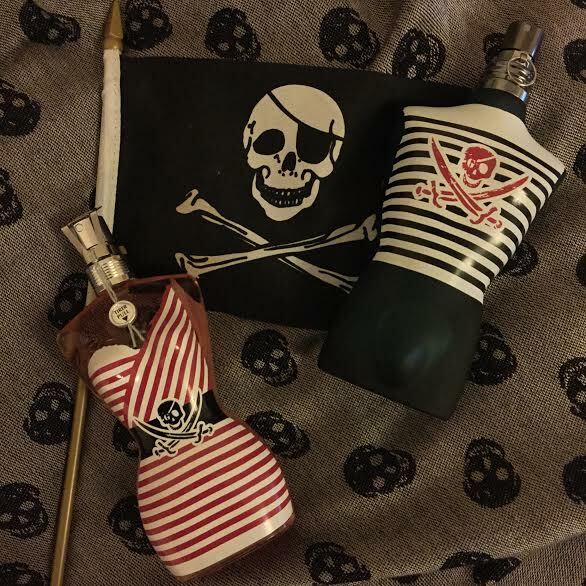 Two of my favourite things in the world have finally joined forces – perfume and pirates. Can you tell that this makes me happy?! The man to link these two excellent forces is none other than the cheekiest chap in fashion, Jean Paul Gaultier, who is just about to launch limited pirate editions of his flagship feminine and masculine fragrances, Classique (Jacques Cavallier; 1993) and Le Mâle (Francis Kurkdjian; 1995). These two rum-swigging classics certainly know how to dress, rocking tattered striped garb marked with the must have centrepiece for any self-respecting pirate – the skull and cross bones. The scents remain the same masterpieces as ever, a glamorous and sensual floral oriental for Classique and a steroid-fuelled fougére for Le Mâle, with the swashbuckling bottles making for a must-have collector’s item. So, if you’re looking for a little bit of an adventure on the high seas, then look no further than the fashionable shores of Island Gaultier. The Classique and Le Mâle Pirate Editions are available nationwide as of 02 February 2015. Classique will be available in 100ml Eau de Toilette for 72 doubloons and Le Mâle will be available in 125ml Eau de Toilette for 58 pieces of silver. Samples and quote via Jean Paul Gaultier. Image is my own. Posted in Jean Paul Gaultier, Limited Edition, Smelly News and tagged Classique, Floral, Fougère, Jean Paul Gaultier, Le Male, Limited Edition, Oriental, Perfume, Pirate. Bookmark the permalink.